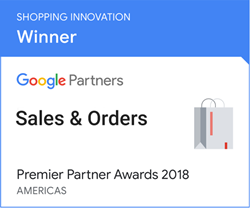 Sales & Orders, the first and only Management Software for Google Shopping, Premier Google Partner and Elite BigCommerce Partner was honored during the Google Premier Partner Awards after winning the coveted Shopping Innovation Award. Long Island-based ecommerce marketing software company Sales & Orders has been named the winner in Shopping Innovation at this year’s Premier Partner Awards, presented by Google Partners. The Premier Partner Awards honor innovation in digital marketing across Search, Mobile, Video, Display, Shopping, and Growing Businesses Online. Sales & Orders has become the leading platform and team specializing in Google Shopping, and implementing key strategies to help online retailers take advantage of one of the fastest growing search engine advertising campaigns types in Google Ads. Sales & Orders is part of a select group of digital specialists that Google celebrates as Premier Partners. To qualify as a Premier Partner, digital marketing agencies and professionals must pass a series of exams, and prove their expertise in using and applying Google’s advertising products. Originally a build and design firm for ecommerce websites, Sales & Orders developed the first and only Management Software for Google Shopping and in November of 2017 officially partnered with leading ecommerce platform provider BigCommerce with the launch of their free product feed app Google Shopping by Sales & Orders. It was for that very same partnership that Sales & Orders prevailed as the Premier Partner Award winner in the Shopping Innovation Category. Google Shopping by Sales & Orders is now one of the highest rated apps in the BigCommerce App Marketplace with over 100 reviews and a 5/5 star rating. Today, Sales & Orders supports over 5000 ecommerce websites using Google Shopping to drive traffic to their stores. With their feed tool, they publish over 60 million products to Google Merchant Center and their team of experts manage thousands of ad campaigns for businesses ranging from small shops to major enterprise brands all around the world. Winning the Premier Partner Award for Shopping Innovation in the Americas is a great accomplishment. 27 agencies applied for the award, and only 7 finalists were named. Out of all the applicants, Sales & Orders took home the trophy. Built and managed by a team of ecommerce design, development, and marketing experts, Sales & Orders is the first and only Management Software for Google Shopping. As a Google Premier Partner, Sales & Orders is recognized in the top elite of Google Partners for their commitment to transparency and an always customer-first approach. Sales & Orders provides an array of products and services that leverage Google Ads, Bing Ads, and Facebook Ads advertising campaigns to help ecommerce retailers succeed online. Google Partners is a special program that allows marketing firms and agencies become certified in the various Google advertising products such as Search, Display, Mobile, Video, and Shopping. There are two separate classes of Google Partner: Standard and Premier. While all applicants to the program are required to meet certain criteria and standards to officially become a Google Partner and there are even specializations that partners can fall into, the naming as a Premier Partner ranks a company amongst the most elite for their commitment to the utmost in customer care. The Winning Success StorySales & Orders was recognized for their work with leading ecommerce platform provider BigCommerce.